I’ve run into alot of people who say “My smartphone is my computer”. The thing is, a smartphone isn’t a viable replacement for a computer, at least not at this point. To effectively own a smartphone, you still need to own a computer unless you don’t care if you loose all of your data. Contacts, reminders, calenders, photos and videos, etc. If you own a smartphone, and you say, take pictures, you can’t expect to keep them on that phone for all eternity, nor can you expect the device to have enough storage to handle the amount of data you generate for decades to come. So what’s to be done with them? Well, you have choices. These days, there’s all sorts of “cloud based solutions” to store your data on such as iCloud drive, Dropbox, Google Drive, and Microsoft One Drive, but those involve monthly fees, and many people don’t want to spend (even a tiny bit) on a cloud based storage system for a permanent storage solution. 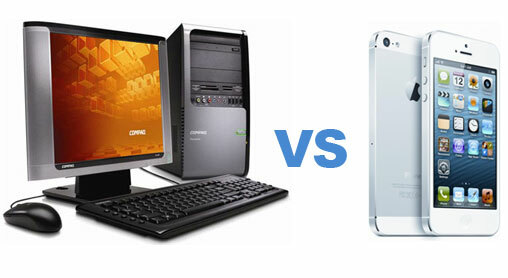 At the same time, many people say they can’t afford a desktop computer, which is a bit silly, because if you can afford a smartphone, you should be able to afford even a cheap desktop computer for $500 (or less if you’re willing to go used). And computers are capable of acting as a good place to offload data to for backup and “permanent” storage. I say permanent in quotes because even your computer can head south and loose all your data as well, but a least you can back them up to external sources such as hard drives, flash drives, and DVD. Besides, even if you exclude the storage issue, you still need to maintain the smartphone. What if the operating system gets corrupted on your smartphone? You need a computer to restore the operating system on your phone. A computer is completely capable of restoring itself because you have root access to the device, and can mount a drive, and run software on it, even if the machine doesn’t have an operating system in place. Phones just can’t do that. Phones are locked down, and there’s no way to mount a drive to boot from to install an operating system. Hence, smartphones are smartphones, they’re not computers, they simply contain computers. All too often I’ve heard people complain that they run their business from their smartphone, which is perfectly fine, but when the phone takes a dive, and needs maintenance, don’t complain that the phone is at fault. If you run a business from your phone at the very least, maintain a backup phone in case your primary one fails, and maintain backups via the cloud or a computer so your data is safe. Sure, it would be great if devices never broke, and data was never lost, but the reality is that, just like everything else, smartphones aren’t perfect, and fail at times. Smartphones are machines, and like every other machine, over time, they break down and need maintenance or replacement. This is a normal fact of all machines. When you buy a car, you drive it, eventually, it breaks. Do you run back to the dealer and complain that it broke? Of course not, you take it to a mechanic and have it serviced. Since the dawn of computing, this has been known, and provisions have always been in place to safeguard data and keep the business running with alternate backup equipment. If you’re new to the game, then fine, just take the time to understand data loss can happen, that machines do break, and it’s incumbent upon you to safeguard your data, and maintain backup hardware if you’re so reliant upon it to run your business. “Real” businesses know that, and take steps to safeguard their data and have backup equipment to step in when hardware fails, so you should too.